What is あなた お気に入り Non Canon pairing? Note: If あなた don't like the couple don't say anything. 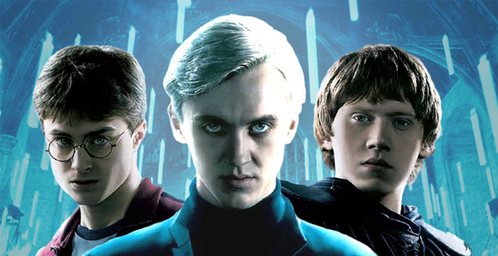 I like Draco & Harry. I also like the canon couple Ron and Hermione. What about あなた people? HEY, HOW COME THERE HASN'T BEEN ANY WEIRDOS THAT 発言しました 'DRAPPLE' YET? they make ten times もっと見る sense to me than Harry and Ginny. Whenever Harry was around Luna, he was himself. He wasn't confused about life, and she always helped him to figure things out. Ginny really didn't do anything, and their relationship seemed forced. Hiding 16 comments... click to show. Eh I like Nuna soooo..
Luna, physically, isn't Harry's type. She has long, scraggly hair and he is attracted to girls with long sleek hair (i.e. Ginny, Cho, Fleur, Pavarti). When he first met Luna, he saw her as having a dotty expression on her face- not good. im a harmony ファン too! yay!! what other couples do あなた like? I absolutely 愛 everything Snape/Hermione. I don't know why, but they work for me as a couple. They are both brilliant and powerful with a similar sense of humour, even though Snape's a bit もっと見る cruel. They would make a logical, and passionate couple, I think. So much less irritating that H/Ron. Luna can do better. Neville/Hannah FTW. 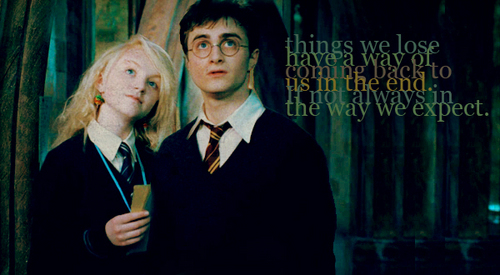 Harry and Luna! Harry always seems relaxed and happy around Luna. 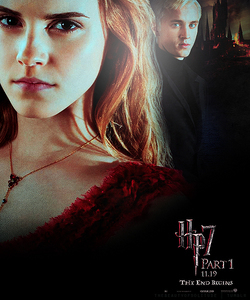 Draco/Hermione. However, I 愛 Ron/Hermione. finally! someone who shipd the same things i do! Dramione. A pureblood and a mudblood.A forbidden 愛 and a romantic couple that shows that everything is posible, they can fight against everything to be together. They are absolutely wonderful. Whatm dracofan, didn't あなた know they eloped to Las Vegas and got married last month? i hate luna/ neville too. it's so cliche to stick the oddballs together. plus...they just ...wouldn't match. I don't think they should be together just because they're both outcasts, I think that because of their personalities seem to go well with eachother. I honestly don't think their personalities really mesh together well enough for them to be together. Are あなた referring to me as the friend who doesn't like them, Sarah? Because I'm not your friend, I'm your wife. They don't mesh well together at ALL. Out of all of the group, Neville was the MOST reluctant to be around her, even looking scared of her, while Harry was the first to accept her. Neville and her are outcasts, but that's all they have in common. Hiding 8 comments... click to show. They're my お気に入り non 大砲, キャノン pairing! Hiding 12 comments... click to show. If only Dumby wasn't gay... 愛 these two! 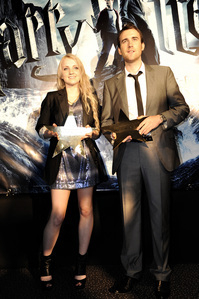 YEAH, Luna/Neville. They should have gotten married. ^ it's the guy that plays him, Matt Lewis. When I think of the young boy being so unsure at the sorting in the 1st movie... then of the traumatized student in GoF... now a handsome lad ! aawww! they look soooo cute together!!! 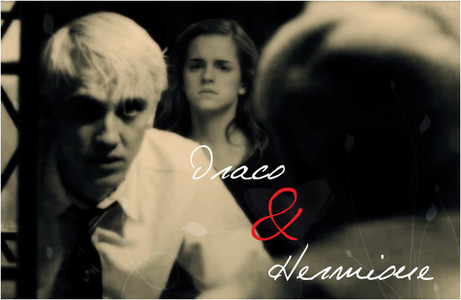 I really 愛 Romione, but the idea of Draco and Hermione as a couple really fascinates me. Hiding 9 comments... click to show. Dramione（ドラコ＆ハーマイオニー） is the best couple! Well I don't know it sort of is canon a tiny bit. But mostly non-canon. The only true part is her feelings for him. 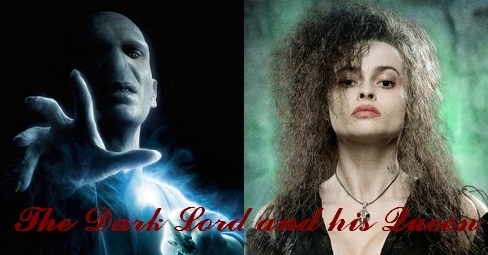 But I ship Bellatrix Lestrange and Lord Voldemort. On their spot here I even gave them children. Twins. A girl Crucia and a boy Imperio. After two of the three unforgivable curses of course. My absolute faveortie. HANDS DOWN! 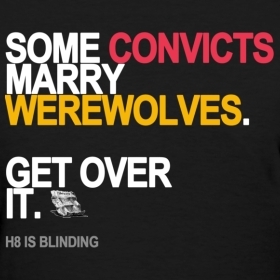 In my oppinion, Voldemort should love. They're pretty much made for eachother! Poor Bella. :( She loves someone who CAN'T love. Voldatrix! YAY. They're perfect for each other! Lady Voldemort... または Mrs Tom Riddle. Whoa, that sounds great indeed. The もっと見る I see them on pics, the もっと見る I like them as a ship. I like Harry/Hermione, Viktor/Hermione, and Snape/Lily. I just think they would have been lovely together. Hell, I'd root for DRACO/LUNA before them. Come and 登録する us there ! Share your pics, manips, fanart and fanfics there ! You're welcome ! 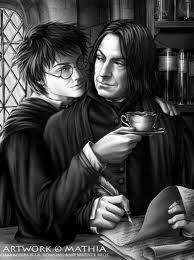 I enjoy a Dominant!Severus, whatever his female partners. I'm not into スラッシュ for any pairing though. Draco/Luna is the only スラッシュ pairing I like for now. Err... スラッシュ is either male/male または female/female. Draco/Luna is a het(ero) couple. I like ALOT of non canon couples,heck, I like alot of couples, canon または non. Remus and Sirius is my お気に入り out of the list. 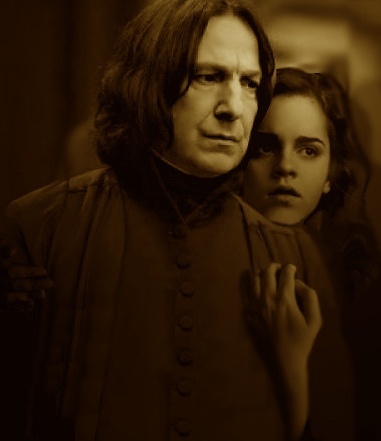 Well i 愛 th idea for dramione. it would bring out a lot もっと見る drama and emotion and it would be a better connection than romione. i mean the hot bad boy ending up with the teachers pet would be a lot もっと見る interesting than the best friend relationship, right? BUT THE SHIPMENT I HATE THE MOST IS DRARRY!!! I MEAN EWW!! IT'S NOT LOICAL AND WE ALL KNOW THEY DON'T ACT LIKE THAT!!! anyway i just needed to say that because draco is my お気に入り character and i hate it when people think that way... not to be mean または anything but its just kinda wrong like the teacher/student thing...eeewww! But now i am a bi supporter of ME AND DRACO!!! i mean when i first read the book i automatically relized how much me and draco are a like and how perfectly we would go together. i mean we would have the same problems and intrests and we have the same kind of personality that nobody really gets. i mean we would get each other so well, we would just be perfect together. no...no, its just disturbed and wrong...it creeps me out...uugh! Nothing wrong with gay pairings. no its just wrong for two people that obviously aren't that way!!!! Especially these boys that have obviously no intrest WHAT SO EVER with being involved in that!!! i meanit makes no sense....They never have shown that intrest in anyway and especially not towards each other...I never 発言しました there was anything wrong with gay pairings...i just 発言しました that that gay pairing is wrong. I started out shipping Severus/Hermione, the epilogue and Severus' death severely irritated me. I searched for another answer. Of course, none of these are canon. The ONLY canon pairing I remotely enjoy 読書 about is Tonks/Remus. All the others seem to contrived and do not fit, at least to me. Harry/Luna really works for me. I also find most canon pairings to be forced and somewhat boring. Remus and ニンファドーラ・トンクス as well as Ron and Hermione are the only ones that I like. I dont know if I could ever read my way through the 本 a 秒 time because as its been 発言しました before harry and ginnys relationship feels rushed and underdeveloped. Luna has so much もっと見る to offer harry than ginny. Ya they have opposing personality traits but thats another factor that would make them twice as great together, I mean as the saying goes "opposites attract". I never really thought much about shipping または how horrible the idea of ginny and harry is and how much better he and luna are for eachother tell I read a fanfic titled Learning to Lovegood. あなた guys should check it out its sooo good. Anywho ya Luna and harry all the way. Whatever あなた want to call it, I 愛 it so so so so so so much! My お気に入り is (and probably will always be) Remus and Sirius. I can't say (write) how I ended up shipping them, it just sort of happened. I regret nothing! Luneville. I'm currenty in a roleplay using that pair and it really fits. Draco and Harry. They are my OTP. 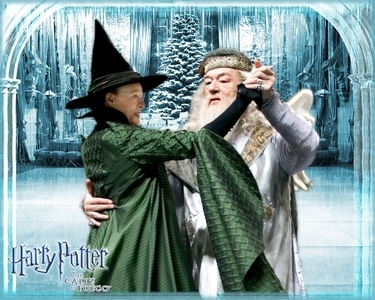 I read no other Harry Potter pairing, except maybe Albus-Severus and Scorpius. I hate Harry and Ginny with a passion. Worst couple ever, practically brother and sister. Harry and Luna, hands down. I knew he was going to end up with Ginny, but I think Harry/Luna makes much もっと見る sense. They have way もっと見る in common, and they just seem to connect. 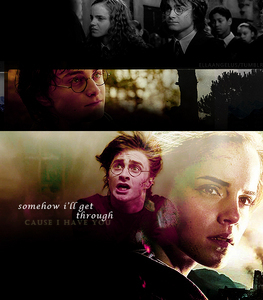 I am and will always be a Harmony (Harry/Hermione) shipper until the very end! I 愛 the canon couples, and I understand that if あなた have only watched the movies, あなた would think that harry/luna is far better than harry/ginny, but I 愛 hinny in the 本 because it's so fiery, passionate and unexpected. I bet if J・K・ローリング had 与えられた them free reign then they would have put in as much harry/hermione as possible. I like Draco/Harry and Neville/Luna if that counts. My お気に入り non-canon is most definitely Dean and Luna. There's really none others that intrigue me in the slightest. Where all my Dramione（ドラコ＆ハーマイオニー） sailors at?? ?